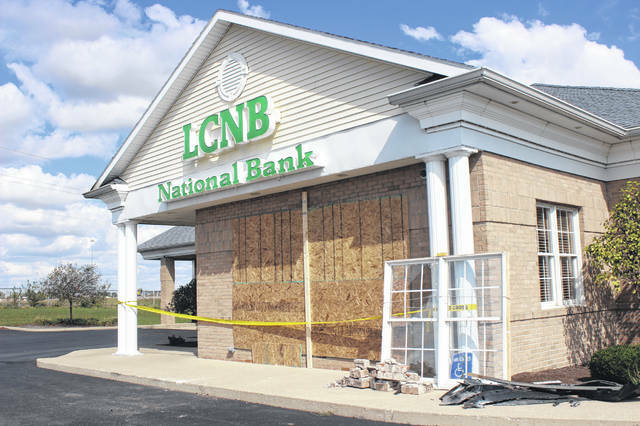 A driver who lost control of a vehicle he was driving crashed into LCNB National Bank in Washington C.H. Monday night. The bank was under repair on Tuesday. A 15-year-old boy lost control of a Honda Accord he was driving Monday night and crashed into the front of LCNB National Bank in Washington C.H. Just after 8 p.m., the boy, who was traveling with a 15-year-old passenger, was driving southbound on Leesburg Avenue when he attempted to make a left turn onto Commerce Boulevard at a high rate of speed, according to the Washington Police Department. The vehicle struck the south side curb when he reportedly lost control of the vehicle. The Accord traveled across Commerce Boulevard northeast, over another curb, through a grass area in front of the bank, struck a handicap parking sign, went over two more curbs, and crashed into the front of the bank. According to the report, it caused substantial damage to the building. No injuries were reported. The 15-year-old boy was cited for reckless operation of a vehicle. The bank was closed for business Tuesday as repairs were being made, however the drive-thru was open for customers. https://www.recordherald.com/wp-content/uploads/sites/27/2018/10/web1_IMG_7110.jpgA driver who lost control of a vehicle he was driving crashed into LCNB National Bank in Washington C.H. Monday night. The bank was under repair on Tuesday.